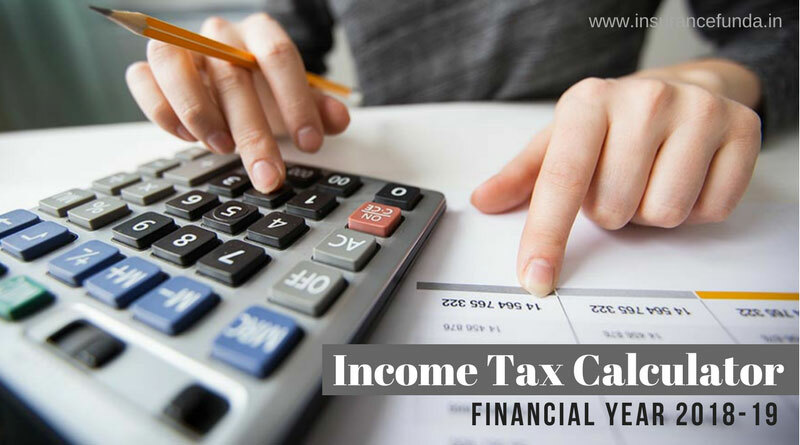 Easy Income Tax Calculator for Financial Year 2018-19 (Assessment Year 2019-20). Easy Income Tax Calculator from Insurance Funda is an Online IT Calculator to compute your income tax liabilities in simple steps. Provide the details such as like Age, Income details, exemptions etc. and get a detailed Income Tax calculation. Rs. 40,000 standard deduction has been introduced for employees. Long Term Capital Gain Tax has been introduced on capital gains exceeding Rs. 1,00,000 upon sale of equity share or units of equity oriented funds. Applicable rate is 10 % of the Capital Gain. Senior citizens will get higher interest income exemption up to 50,000 on deposits in banks and post offices, including recurring deposits. Earlier the rate was 10,000. Deduction for senior citizens on payment of health insurance premiums is set to go up from Rs. 30,000 Rs. 50,000. Income tax deduction for medical treatment of specified diseases has been hiked to Rs. 1 lakh for very senior citizen (earlier Rs. 80,000) and senior citizen (earlier Rs. 60,000). Online IT Calculator enables you to calculate your tax liability in simple steps. This easy calculator can be used easily and can be used even by people who do not have any idea on the income tax rules. Click on the button given below to open the income tax calculator. Click on the button provided above to open Income Tax Calculator. You can view the calculator as shown below. Fill your details about income and deductions as per the prompts. After filling the details, click on the calculate button as shown below. Your tax liability along with the calculation sheet shall be available.